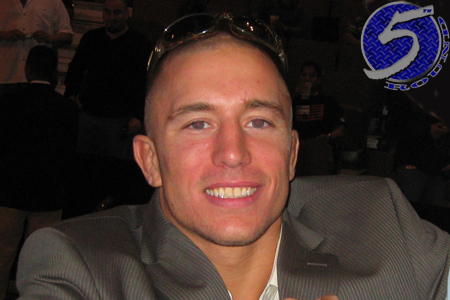 Last week, former UFC welterweight king Georges St-Pierre (pictured) was linked to a Canadian drug kingpin awaiting sentencing in the United States after pleading guilty to trafficking in massive amounts of marijuana. Jimmy Cournoyer, who is known as “The King of Pot,” filed a position to the court that included a letter of support by St-Pierre. In the note, St-Pierre said he and Cournoyer had become as close as brothers over the years. In addition, he has visited Cournoyer in jail on two occasions and stated he’ll provide a safe haven for his buddy once he’s released from prison. The MMA world was taken aback by St-Pierre’s undying support for a man who committed such crimes, particularly since GSP has been so outspoken about the use of drugs during his illustrious fighting career. A letter I signed in support of my friend Jimmy Cournoyer, who has recently pleaded guilty to a number of drug traffic-related crimes in the U.S., has generated a great deal of controversy over the last few days. First of all, the letter I signed was a mistake – my mistake. I will not go into detail as to why and how the letter came about because it’s not going to right a wrong. I simply wanted to help repatriate Jimmy to a Canadian prison, closer to his family, if that was possible. My friendship with Jimmy is based on our mutual passion for martial arts and going to the gym. I was not aware of Jimmy’s crimes until he was arrested by the U.S. authorities. I do not condone any of his criminal actions. He will and should pay for his actions. My position against the use of drugs has been on record for years, and speaks for itself. I have been to visit Jimmy in prison – twice so far. We also had many conversations since his arrest. Why? Because I believe in redemption, and I believe in loyalty. I will continue to support him – as a friend. In fact, if Jimmy leaves prison one day, I should be there to help him start over in a better way. I want to unconditionally apologize to those who have been offended by my actions. But I often say that the wheel of life turns and turns, causing ups and down for each of us. I was also taught that a real friend is there to offer support at the best and the worst of times.